I am looking forward to learning new skills, whether it be in nursing or any field. I am open to new opportunities. I give 100 percent to each task and goal. I am excited to start on a new road and find out where it will lead me! Greatly enjoy working with people. Excited to always be learning new skills. Enjoy taking on a challenge and surpassing the goal. Intake of all patients obtaining medical, family and social history for data entry in clinical setting. Phlebotomy, removal of sutures and staples. Wound care. Immunizations, injections and education about each. Ordering all medical supplies and keeping them consistently stocked, organized and easily available. Supervising the scheduling of patients to ensure the flow of patients through their visit stay on time. Phone triage. Educating patients about their health, illnesses, medications, diagnostic tests and options. Multitasking to meet the needs of the doctor, the patients in the office, the patients calling in and the multitude of orders, medication refills, letters to write, records to obtain, referrals to schedule and numerous other tasks. 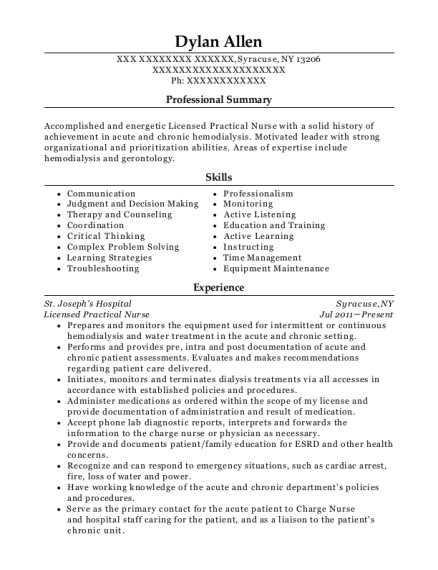 Being part of a unique interdisciplinary team to care for geriatric psychiatric patients during a time of exacerbation of their mental illness. Caring for up to six patients assigned each shift. Supervising nursing assistants in their care of the patients. Monitoring patient's diets, behaviors, activity and sleep times, intake and output, interactions with their families and progress during their stay. Sitting in on Care Plan Meetings to work with the hospital team and the patient's family to set attainable goals and review progress. Worked with many members of several interdisciplinary teams to care for patients with issues ranging from major illness to live threatening trauma. Assisting in the care of patients with ages ranging from infants to geriatrics. Learning so many exciting techniques, and meeting many different people from so many various backgrounds. Entering orders, obtaining specimens, making sure the doctors, PAs etc. had all of the results in an efficient time. Staying calm and reasonable during times of high stress and pressure while also carrying out assigned tasks. 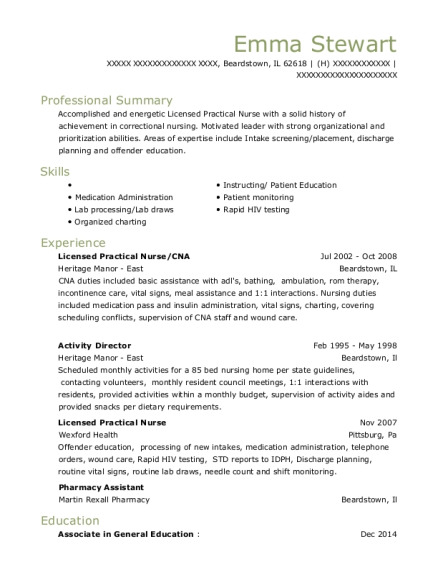 This is a resume for a Licensed Practical Nurse in Twin Falls, Idaho with experience working for such companies as Dr Warren Dopson and MD. 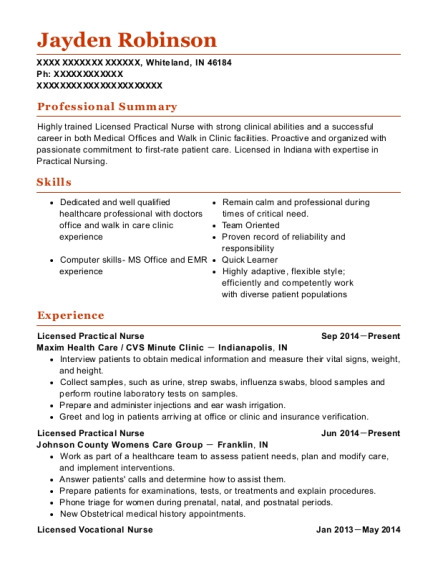 The grade for this resume is 0 and is one of hundreds of Licensed Practical Nurse resumes available on our site for free. 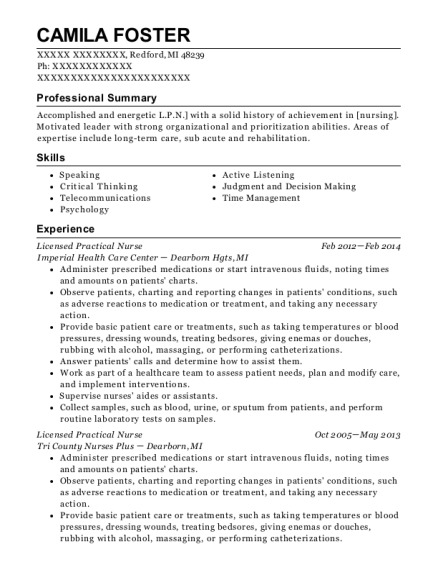 Use these resumes as templates to get help creating the best Licensed Practical Nurse resume.